Just Visiting and Griffin Independent present the World Premiere of THIS IS WHERE WE LIVE by Vivienne Walshe at the SBW Stables Theatre, Kings Cross. THIS IS WHERE YOU LIVE is the Winner of the 2012 Griffin Award by Vivienne Walshe, directed by Francesca Smith, leader of the independent theatre company, Just Visiting. This is the inaugural production for this company and the World Premiere of the play. This company has been working on this project since 2006 when it was part of the Australian National Playwright's Conference. It arrived "as a conventional narrative-based 4 character drama" and has now been shaped into a two handed poetic drama. It has the shape and form of many a recent, new, independent work, for small companies or ... In fact, the recent Griffin Company production THE BULL, THE MOON AND THE CORONET OF STARS by Van Badham, is one such. It is a form that I have begun to find very tedious, indeed. It usually has two characters (sometimes, three or four) using heightened, poetic language ( to quote myself), " using 'novelistic ' techniques, (with) the actors describing events, (then) offering observations as characters, as well as employing 'mimicry' as the actual characters in interaction - stepping from one form of address to the other, directly, seamlessly, to us, the audience". It is, was, in Australian theatre terms, perhaps, a post-modernistic dare that has become, through over use and wear, no longer truly fashionable or even, effective. It can kind of irritate and bore. In fact the conventional narrative-based 4 character drama, the way this play first appeared in 2006, may be the new cutting edge, it is so rare a form to see on our stages. "Oh, no," I thought to myself. It was a little more highly staked than that, as I had brought an American theatre director, a colleague of mine from my American Conservatory Theatre (ACT) days and had hoped he would have a good time and be impressed with a new Australian play. It was more like, "OH,NO!!!!" and painfully suppressed - I almost injured myself, internally. Another character called Chris (Yalin Ozucelik), entered, and he too made contact with us with the same technique of description of surroundings, of others, and especially of Chloe. He is the class room oddity, bright, but physically immature, the nerdy outsider, and worse, the son of the teacher in the room. It is bad when in a moment of unguarded anger he calls out, "DAD", the rest of the classroom is onto it with pernicious glee. Poor, Mr Chris. However, the cumulative impact of Ms Torch's character and that of Mr Ozucelik had begun to invite me in. It was not now,"Oh, no", but, "Well, what else?" I became, reluctantly, curious. As time moved on, I became engaged and then engrossed and then committed, then protective and then moved and finally entranced. I, and, I am pleased to report, my guest, had had an almost identical experience (we talked over dinner, later). Despite my prejudices I had been won over and had had a very beautiful experience. I, we, applauded, generously. 1. The writing by Ms Walshe is delicately beautiful, full of weird and wonderful observations and points of view. Surprises - truthfully banal ones that rang refreshingly clear because of their uncluttered cliche imageries. Stuff from my childhood, it seemed, and that of many a famous coming-of-age novel that I have gorged myself with in times past. The Australian author, Sonya Hatnett and her novels for adolescents, say, BUTTERFLY - a recent book club read; JASPER JONES by Craig Silvey and even, the great American classic, TO KILL A MOCKING BIRD by Harper Lee came flooding back to me,in the Griffin space, to support me, imaginatively, through this play. High praise, indeed.The narrative of the attempted 'coupling' of this pair of young adolescent misfits was quite decidedly recognisable and delightfully, innocently doomed, but, always full of hope. One hoped against the hopeless, for Chloe and Chris. They make an impression and I still care for them. The quality of the writing is quite simply wonderful and graspable and unpretentious. 2. Ms Smith the director has decided to cast two very much older actors in the roles of these two barely, teenaged characters. It was an inspired choice. 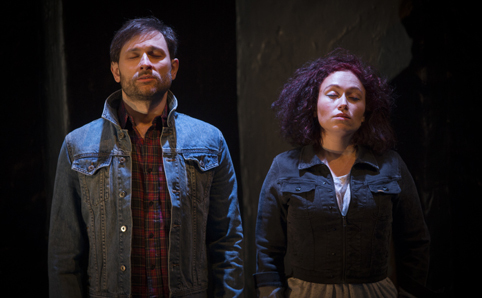 The nuance of these fractured and 'old souls', Chloe and Chris, bred from discontent and unhappy ground, are redolent in the bodies, imagination and life experiences of Ms McKenna ( I can't go on using her cabaret nom-de-plume) and Mr Ozucelik. Both these actors know these lives and can handle them with deep memory, love and very apparent care. There is no guessing here. No adolescent inexperience., from more age appropriate casting. The knowledge of their own long gone adolescence glows within these actors, exists, shinning in them. That they are also two very accomplished artists with voices of poetic range with the ability to have us see what they see, to feel what they feel, to know what they know, is more creative power to them. They also have a sense of wisdom and humour, that is an undercoat of support for the drama of some of the story. Not a single vocal gesture is undervalued or under delivered. Physically, (except, for me, that awful entrance of Chloe's), is overdone or exaggerated. They simply allow themselves to be imaginatively 'possessed" - neither young nor cliched with characteristics. ThesE actors simply are, rippling with imaginative effect and affect. 3. Ms Smith, the director has, mostly, made herself invisible. She simply works to let the work, which she has nurtured for nearly 7 years, show. It always does, I reckon. I know it does. When one creates for others, with others in mind, not oneself and one's own ego, then beauty can arrive, transcend for the audience, in the simple act of storytelling. Untrammeled and loved and joyfully given. Take note of the music score by Marty Jamieson and the delicacy of its entrances. The costumes are just a little too costumed, too neat, especially considering Clohe's background - too well fitting. The lighting is too simple and not subtle enough in this space. So, here I am reversing my prejudices for Ms Walshe's THIS IS WHERE WE LIVE. To quote the author of the moment, F. Scott Fitzgerald, from a little short story, THE CRACK-UP: " ... The test of a first-rate intelligence is the ability to hold two opposed ideas in the mind at the same time, and still retain the ability to function. ..." In recommending this play I know I am functioning. Well. I think that this is the best new Australian play, writing, I have seen this year, so far. This Griffin writing prizewinner is deserving. Congratulations all.